Julie is a junior at John Carroll University studying political science and entrepreneurship from Cleveland, Ohio. She has been involved with fair trade and social justice issues since high school. She co-led her border wall project at John Carroll with her students for social justice club in fall 2018. This advocacy project focused on creating respectful, open, and supportive conversation about the news, stories, and facts surrounding immigration. 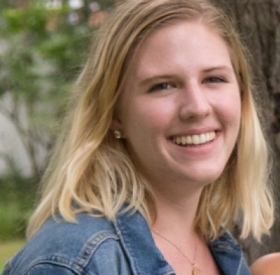 She hopes after graduation to continue to advocate for peace and justice related issues or become involved with fair trade organizations and small businesses.